The Disappeared is Flint’s very first adventure, the story that turns him from a police detective in the Armstrong Dome on the Moon into a Retrieval Artist. Available from Audible, or in electronic and trade paperback formats. Amazon, B&N, iTunes, Kobo, Smashwords and others. A woman dies in the domed city of Armstrong on the Moon. Detective Noelle DeRicci discovers that the victim is a Disappeared—an outlaw in hiding wanted for crimes against an alien civilization. Only DeRicci’s old partner, Retrieval Artist Miles Flint brought the Disappeared home, something he would have only done if he believed the alien government would exonerate her for her crimes. But Flint and DeRicci are no longer partners; in fact, they’re on opposite sides of the law. Flint can’t tell DeRicci about his client’s role in a war between humans and a mysterious alien race. The Disappeared’s death is only the first volley in an escalation of that war, a war that threatens to engulf the entire solar system. As Flint investigates, events move swiftly around him, and suddenly what began as a simple murder case turns into an incident that might destroy the entire solar system…. A high-velocity rush through cultures in full clash, as fear and panic overwhelm the day, and Rusch’s writing makes the far-out scenario feel as present and credible as today’s breaking news….Rusch has outdone herself yet again. Available from Audible, or in electronic or trade paperback formats. When she arrives home from school on Callisto, Talia Shindo finds two strange men in her house. They terrorize her, and kidnap her mother. The men leave Talia behind. She’s thirteen, brilliant, and determined to find her missing mother. Retrieval Artist Miles Flint works a seemingly unrelated case, digging into files left him by his mentor. Only he finds a connection to the Shindo kidnapping, a connection that shatters everything he ever knew. The two cases collide, changing Flint, changing Talia, and changing the universe around them—forever. Hadad Yu “recovers” things for a living. Things, not people, not animals. Things. Until he gets in trouble and must work for the alien Gyonnese. They want a person to answer for her crimes, and they want to use Yu to get her. He reluctantly agrees, and sets off events that will change his life and the lives around him forever. A companion piece to Recovery Man, The Recovery Man’s Bargain explores the motivations of one of the stranger characters in the Retrieval Artist universe. Retrieval Artist Miles Flint has a mission: take down the law firm of Wagner, Stuart, and Xendor. He enlists the aides of old friends and old enemies. But as the mission gets underway, one member of his team dies horribly. Flint can no longer take on the entire universe. He violated the rules of his Retrieval Artist mentor and now has a lot to lose. But he can’t reverse the events he set in motion—and the crisis he caused might destroy everything—and everyone—he loves. All of his short life, Paavo Deshin has seen ghosts. The same two ghosts who have now approached him on the school playground, ghosts who look older and actually smell bad. Paavo’s cry for help brings the authorities, a few lawyers, and Retrieval Artist Miles Flint, who learns some secrets about the ghosts—and about Paavo’s parents. This short stand-alone science fiction novel in the Retrieval Artist series received a Special Mention from the prestigious international UPC contest. “The Possession of Paavo Deshin” is a masterfully crafted story. Definitely don’t miss this one. Four years ago, a bomb destroyed part of the dome protecting Armstrong, the largest city on the Moon. Now, as the city celebrates its survival with an event it calls Anniversary Day, a larger threat looms—one that begins with the murder of the mayor, and spreads across the Moon itself. Even with every new technological device at her disposal, Moon Security Chief Noelle DeRicci can’t stay ahead of the unfolding disaster. As the situation gets worse, Retrieval Artist Miles Flint hurries to his daughter’s school to protect her. And Detective Bartholomew Nyquist finds himself in the middle of everything, from that first bombing to the Anniversary Day crisis itself. The Moon, shaken by the Anniversary Day tragedies, deals with devastation. The Earth Alliance believes another attack imminent, but no one knows where or when it will strike. Just like no one knows who ordered the attacks in the first place. The Moon’s chief security office, Noelle DeRicci, does her best to hold the United Domes government together. But Retrieval Artist Miles Flint, dissatisfied with the investigation into the Anniversary Day events, begins an investigation of his own. He builds a coalition of shady operatives, off-the-books detectives, and his own daughter, Talia, in a race against time. A race, he quickly learns, that implicates organizations he trusts—and people he loves. The latest Retrieval Artist science fiction thriller is an engaging investigative whodunit starring popular Miles Flint on a comeback mission. The suspenseful storyline is fast-paced and filled with twists as the hero comes out of retirement to confront his worst nightmare. Amazon, B&N, Kobo, Smashwords and others. The Anniversary Day bombings on the Moon sent shockwaves throughout the Earth Alliance. No one knows who created the clones responsible and turned them into ruthless killers. No one knows where or when they’ll strike next. The bombings compel Earth Alliance Frontier Marshall Judita Gomez to launch an unauthorized investigation into a case from her past involving the murder of clones. An investigation that might cost Judita not only her career but the lives of her crew. This third book of the Anniversary Day Saga sheds further light on the Anniversary Day events, and introduces several new key characters. The Anniversary Day bombings devastated the Moon, killing thousands. While survivors search for missing loved ones and the rich and powerful set plans in motion to capitalize on the Moon’s misfortune, one ruthless man vows to uncover those responsible for the attacks on the Moon. Luc Deshin, the most feared man in Armstrong, knows all too well the bombings could have killed the wife and son he loves more than life itself. To protect his family, Deshin immerses himself in a criminal network he fought long and hard to leave behind. Deshin doesn’t scare easily, but what he finds in the black market underbelly of the Moon will chill him to the bone. The Moon barely survived the devastation of Anniversary Day. The second round of attacks planned to kill millions more. With the life of every human and alien on the Moon hanging in the balance, the Moon’s chief security officer, Noelle DeRicci, races to discover the identity of the masterminds behind the attacks before it’s too late. Desperate to find answers, DeRicci turns to Retrieval Artist Miles Flint and Detective Bartholomew Nyquist for the kind of help only Flint and Nyquist can provide. A gripping look at a society on edge. The fate of the Alliance hangs in the balance as the masterminds behind the Anniversary Day bombings trigger the final stages of a plan decades in the making. A plan that will bring about the total destruction of every dome on the Moon. As Moon Security Chief Noelle DeRicci struggles with the overwhelming scope of the investigation, Retrieval Artist Miles Flint races to save the life of a man from his daughter Talia’s past. A man with vital information regarding the identity of the masterminds who planned the Anniversary Day bombings. And deep beneath the surface of Armstrong, a dome engineer makes a chilling discovery that could crack the investigation wide open. If only he can get someone to believe him. The thrilling conclusion to the Anniversary Day Saga. Available in electronic and trade paperback formats. To pay off her law school debts, Kerrie works in the public defender’s office at the Interspecies Court. She has more clients than she can defend, most of them from cultures she does not understand. The public defender’s office loses almost all of its cases, but sometimes it gets a win. Kerrie thinks she has a winner. But does she? Or will winning the case mean she loses at everything else? 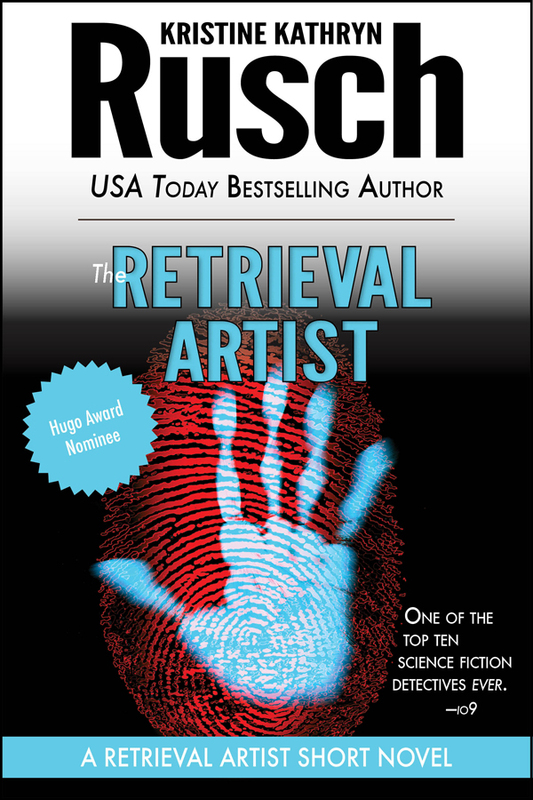 The retrieval artist series is my all time favorite series. I can read one after another after another. I love miles’ character. I tell people all the time about the series. I saw mention of Talia’s Revenge at some point years ago. Is it still in the works ? I thought that she has a lot more story to tell. it’s been 2 years and i am wondering of there will be any more retrieval artist books? I have read all you have publshed i beleive ending with the anniversary Day saga. There will be, but it’ll be another year or two. I’m working on the Diving series right now. Thanks for the question.